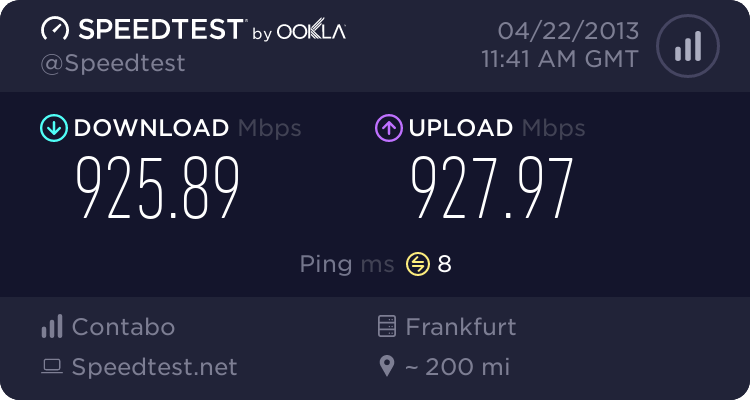 We say thank you to one of our customers who provided the impressive result of the following speedtest on our facebook wall. I would like to quote him: "Damm... That 39.99 euro was deffo worth it!" Of course, we do not want to keep back this result from you on this blog because it's more than worth an extra blog entry. unfortunately, we do not offer live support. You may however call us during our office hours from 8am to 11pm on 365 days per year! Or send us an e-mail to support@contabo.com and we will respond as quickly as possible!